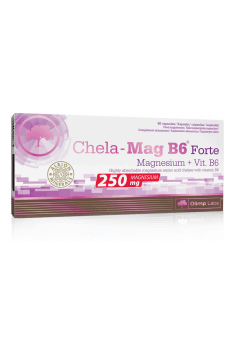 Olimp Chela-Mag B6 Forte is a dietary supplement with the highly bioavailable magnesium chelate Albion® and vitamin B6 which improves its absorption. Thanks to this combination, the supplement enables you to quickly correct deficiencies of these important nutrients. It is recommended especially to individuals with a hectic, stressful lifestyle or complaining of muscle pain, cramps and persistent eye twitch. It will be also a good choice for persons doing work with heavy mental strain or suffering from insomnia, fatigue and irritability. Magnesium is an essential element for the human body. It affects many bodily processes, e.g. it supports the conduction of nerve impulses, promotes the growth of muscle tissue and has cardioprotective effects. What is more, studies have shown that magnesium supplementation is correlated with body fat reduction. This element will help treat agonising cramps. Its role in carbohydrate and protein metabolism is also crucial because magnesium regulates over 300 biochemical processes. Vitamin B6 is a component of many coenzymes which makes it essential to the proper sequence of many biochemical reactions. Vitamin-B6-dependent metabolic pathways are mainly associated with the proliferation and differentiation of cells and cell-cycle regulation, which leads to improved nervous system function and memory and stimulates cognitive processes. Vitamin B6 is related to the kinetics of magnesium and may enhance intestinal absorption of this element. As a consequence, magnesium in a supplement form is characterised by higher bioavailability and has therefore more immediate and stronger effects on target cells. Due to their effects on NMDA receptors in neurons, magnesium ions regulate calcium metabolism, thereby improving learning and memory processes Furthermore, this crucial element has a key role in the protection of resting neurons and stimulates the recovery of cells from injuries and damage. Healthy blood magnesium levels are correlated with improved mood and enhanced mental performance, may have sedative effects and thus reduce stress levels and sleep problems. Normal blood magnesium levels have cardioprotective properties. It reduces the risk of arrythmia and likelihood of developing hypertension. Furthermore, studies have shown a reduction in the incidence of heart diseases (e.g. ischaemic heart disease and myocarditis) in individuals maintaining an adequate intake of magnesium. Supplementing with this element has been also observed to inhibit the development of atherosclerosis, which contributes directly to increasing the elasticity of blood vessels. During a contraction, muscle cells require more magnesium due to a decrease in pH of cytosol. A major magnesium deficiency leads to abnormalities in neurotransmission and impairs muscle contractility, which is manifested in e.g. painful calf cramps and eye twitching. It is worth noting that disorders caused by low levels of this crucial element may not only refer to skeletal muscles but also the cardiac muscle. Magnesium is an essential component of bone tissue. Its normal levels support healthy teeth, thereby reducing the incidence of tooth decay. Adequate magnesium intake aids in maintaining normal bone density which contributes to their endurance and resistance to mechanical strains. In addition, studies on post-menopausal women demonstrated that magnesium supplementation caused a reduction in the incidence of osteoporosis. To sum up, Olimp Chela-Mag B6 Forte is an effective way of making up magnesium and vitamin B6 deficiency. Thanks this unique combination of ingredients, they have immediate and powerful effects on the body. What is more, the supplement has been approved by the Polish Institute of Mother and Child and is completely hypoallergenic, which is extremely important for safety reasons. Take 1 capsule a day after a meal or otherwise after consulting a doctor. The product is recommended to people dealing with painful muscle contractions and increased fatigability as well as to those who have the symptoms of magnesium deficit – fatigue, apathy, depression. Magnesium deficit may contribute to circulatory and musculoskeletal diseases. The recommended daily dose of magnesium is 200-400 mg (1-2 capsules a day). It is best to take the preparation during or a moment after a meal. For a start, I suggest the dose of 1 capsule a day, as taking excessive dosages may bring about a laxative effect.